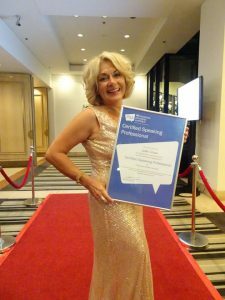 Last night at the Professional Speakers Australia Gala Dinner I was honoured to receive the designation of Certified Speaking Professional (CSP), the highest designation in Professional Speaking recognised here and in the USA. Thanks to my wonderful audiences that lift me to success, thanks to my clients and everybody here on social media that shares me with your worlds… without all of you I have no stage. Thanks to my late hubby Flash, you are the one who said you would support me when I started my business 20 years ago and as you left this world you invited me onto a bigger stage. And thank you to my oldest boy Jack, because on the days I didn’t think I could get on that stage because Autism was so loud and grief so deep, Jack was the reason I could still get up. Thanks for growing up into the amazing young man you are today. Thanks to my Thomas… with Autism along for the ride you taught me to look through the broken windows of my life to the view beyond, you showed me the worst of myself so that I could discover the best of myself and Thomas… thanks for all the wonderful content!! Find YOU and then YOU will shine! The Rules of the Game of Life!